An unaltered photocopy of your DD-214, WD AGO, NAVPERS, NG or other military issued document clearly displaying your award of the Fleet Marine Force Combat Insignia. The Fleet Marine Force Combat Operation Insignia is a miniature 5/16 inch bronze United States Marine Corps emblem that may be authorized by the Secretary of the Navy for wear on specific campaign, expeditionary, and service medal ribbons issued to United States Navy sailors attached to and on duty with Fleet Marine Force (FMF) units during combat operations and sailors on duty with Navy units attached to and operating with Fleet Marine Force units while under Marine Corps operational control during combat operations. 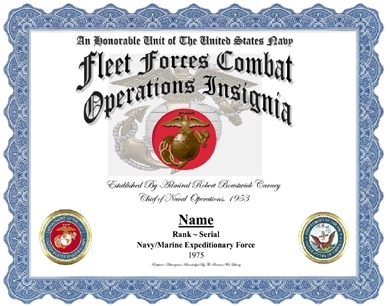 The Fleet Marine Force Combat Operation Insignia must be authorized by the Marine Corps unit commander in order to be worn by U.S. Navy sailors such as hospital corpsmen and chaplains assigned to Marine Corps units and Seabees assigned to naval units operating with Marine Corps units. The Marine Corps unit and sailor must have engaged in active combat action with an armed enemy during the sailor's service with the Marine Corps unit, or the sailor and the Navy unit must have engaged in active combat action with an armed enemy during the Navy unit's operating service with the Marine Corps unit. No more than one Marine Corps emblem may be worn on the ribbons. The FMF combat operation insignia is positioned in the center of both the suspension ribbon and service ribbon of the medal. 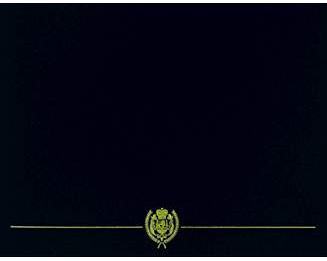 Any other authorized ribbon device such as the 3 16 inch service star or campaign star, are placed on either side of the FMF combat operation insignia, with the first star on the wearer's right of the insignia, the second star on the wearer's left of the insignia, and so on.